Oxford University Press, 370 pp. The Western world is decadent. Its emphasis on individualism is corrupt. Its materialism is dangerous. Its vision of modernity reflects not progress but regress. The West will destroy itself. But if it doesn't, its destruction should be helped along. True salvation can be found only by returning to ancient disciplines and beliefs. Such views may not seem totally unfamiliar. Similar doctrines are held by Islamist terror groups and by those finding common cause with them. 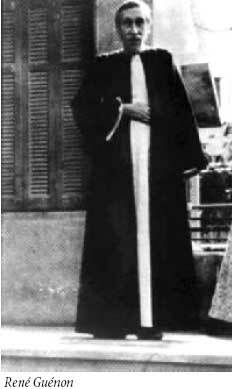 All these ideas but one can be ascribed to the group of writers and intellectuals known as the mainstream Traditionalists, which include, among others, René Guénon, Frithjof Schuon, Ananda Coomaraswamy, Titus Burckhardt, Seyyed Hossein Nasr, Martin Lings, Marco Pallis, Philip Sherrard, William Stoddart, Leo Schaya, Rama Coomaraswamy and Whitall Perry. None of these writers ever suggested that if the Western world does not self-destruct "its destruction should be helped along." There was one writer and thinker, however, who did believe this, the Sicilian aristocrat Baron Julius Evola. What his relationship was with the mainstream Traditionalists has not yet been elucidated, but if they are bedfellows, there's likely to be a lot of tossing and turning. With Evola, they all believed in cyclical time with its four great ages (gold, silver, bronze and iron) and that the modern world was in the Iron Age, or in Hindu terminology the Kali Yuga, the last and most material and corrupt. They all believed in the hierarchical caste system of priests, warriors, merchants and laborers. Each was against psychoanalysis, shamanism, sorcery, Theosophy and all New Age religions, all spiritual eclecticism and invented spiritual paths. And each believed in the return to ancient tradition, the power of initiation, and the reinstatement of the Golden Age by the intervention of the tenth Avatâra, or in the Christian tradition, the second coming of Christ. Where they differ is that Evola was a warrior where all of the mainstream Traditionalists were of the priestly caste. 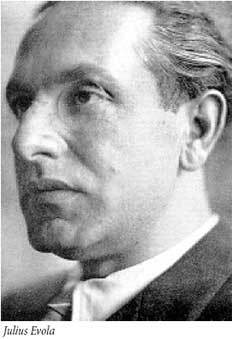 Evola was certainly a thinker, and many of his books, such as Revolt Against the Modern World, Ride the Tiger, The Doctrine of Awakening, and Eros and the Mysteries of Love, are well worth reading for their erudition and challenge to contemporary beliefs, but in calling for violence the baron goes around the bend. In the Islamic tradition a distinction is made between the two holy wars which originated from a saying of the Prophet, who, returning from a military expedition, said: "You have returned from a lesser holy war to the greater holy war." The greater one is of an inner and spiritual nature while the lesser is the material war waged externally against an enemy population with the particular intent of bringing "infidel" populations under the rule of God's Law. Originally an avant-garde painter, Evola's spiritual awakening began with his encounter with the writings of Guénon, whom he later described as "the unequaled master of our epoch." Combining Guénon with the ideas of Friedrich Nietzsche and Johann Jakob Bachofen, Evola's worldview had Traditionalism at its core with the Nietzschean superman and Bachofen's binary typology of uranic and telluric civilizations on its wings. He argued that the brahman and kshatriya castes (priest and warrior) were originally one and only became separated after a decline from the primordial Tradition. He strongly criticized notions of equality, democracy and the Catholic Church. While he was against any racial theorizing of the purely biological kind held by the Nazis, he did see Judaism as having lost its original moorings to become increasingly secularized and "retreating into a ritualistic formalism and thus becoming increasingly abstract and separated from real life." He saw its people as having to uphold values that they cannot realize and thus, becoming increasingly abstract and utopian, "eventually feeling dissatisfied and frustrated before any existing positive order and any form of authority so as to be a constant source of disorder and of revolution." Summing up, Evola says, "Typical of the Jewish soul [is that it moves] between a sense of guilt, self-humiliation, deconsecration, and carnality and an almost Luciferian pride and rebelliousness." It is such pronouncements, together with his clear preference for fascism over democracy (though he felt National Socialism did not go far enough), that have made it difficult for his other ideas and viewpoints to be given much attention.